Organized by curriculum area or time of day, each activity is complete with math concepts, materials needed, and step-by-step instructions. Math is the new focus in early childhood education, and the easy-to-use math concept index is a fabulous feature for teachers so they can easily find appropriate activities for the children they teach. 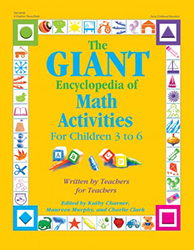 Loved by children because they're fun, and teachers because they are developmentally appropriate, the activities in The GIANT Encyclopedia of Math Activities will captivate children's imaginations and create wonderful opportunities for learning and fun.